I’m not one to turn down the bounty of fresh fish. While I release many of the fish I catch, I can’t resist bringing home an occasional stringer for the table. I’m a big fan of eating locally produced fruits, meats, and vegetables. We get our honey from local hives, our beef from a nearby herd, and many of our vegetables from our garden. Since we live on an island in the Chesapeake Bay, it just comes naturally to eat fish from the waters around us. Unfortunately, those waters are very polluted, so there are strict consumption advisories about fish caught in this area. In fact, officials in Washington DC recently advised no consumption of rockfish caught in the District. I will no longer serve my family striped bass over 30 inches long from anywhere in the Bay because of the build up of toxins. It’s a personal decision, but one that I’m serious about. My children and grandchildren aren’t old enough to make choices for themselves about what is healthy. They’re too young for me to take a chance on poisoning them. That doesn’t mean I won’t occasionally enjoy other species. We’re smack in the middle of one of the strongest yellow perch runs in recent memory. 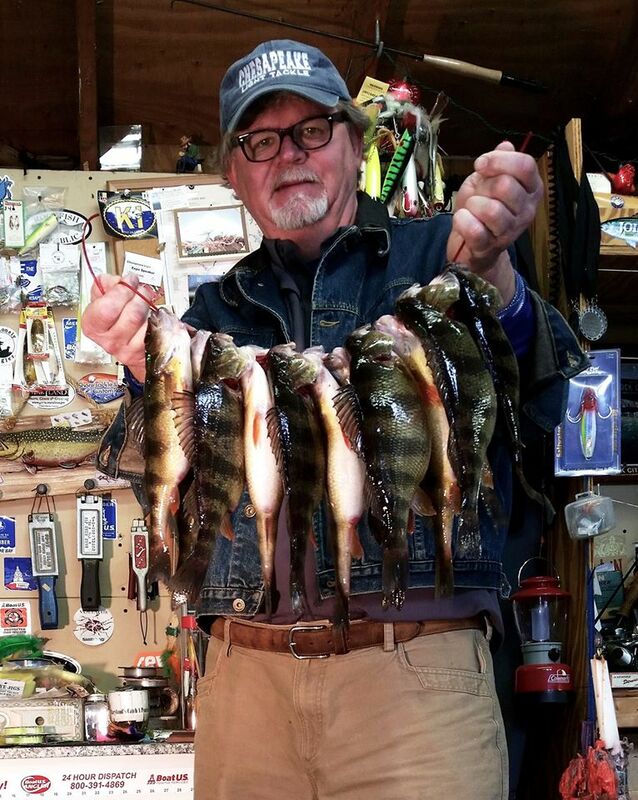 Fishing is especially good on Maryland’s Eastern Shore where virtually every tidal tributary is producing limits of “ring perch,” as they’re nick-named by my neighbors. I’ve made it out to several local streams over the last couple of weekends, always fishing from shore. Thanks largely to good management initiatives set in place by the previous DNR administration, the catching has been great. 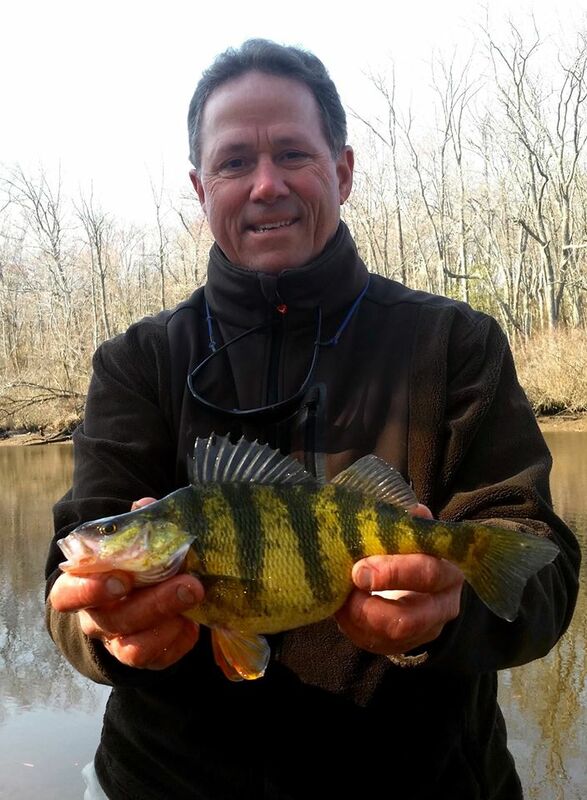 It’s especially encouraging to see many perch over twelve inches long in this year’s run. 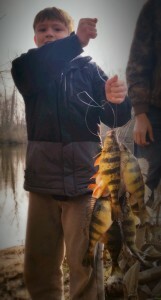 My friend Phil Kerchner and I kept a limit of big perch Saturday morning. They ran so big that we threw back everything less than 11 inches long. That’s good fishing! Since most of fish we are catching now are pre-spawn, I expect yellow perch fishing to be good for a couple of more weeks. Most fishermen use minnows to catch perch, and that’s a sure way to get them. Just hook up a fish-finder rig or attach a minnow to a shad dart and you’ll probably catch fish. I usually don’t take the time to mess with minnows because I’ve found it to be just as productive to use artificial bait. I use two primary methods. The first is a tried and true family secret I learned from crappie fishing in the lakes of Tennessee, Georgia, and Alabama. 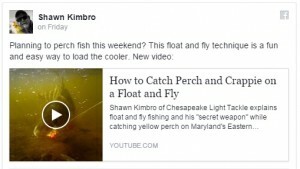 It’s a variation on a float and fly technique that will out-fish minnows most of the time. My father was an expert with this method, and my brother Creig is the best I’ve ever seen with it. I’ve kept this secret pretty close to my vest up to now, but I recently revealed it in a well-attended talk at a local Bass Pro Shops. Since my cards have been revealed, here’s a video explaining the technique. Sometimes, when perch aren’t feeding as fiercely, I’ll cast tiny soft plastic baits. Small twister tail grubs in chartreuse, orange, or white on a 1/32 or 1/8th jig head will do the trick. My friends at Bust ‘Em Baits have designed a tiny little “Stinger” that is deadly for yellow perch. My fishing buddies and I have been casting tandem rigs using one twister tail and one stinger, and working it very slowly across the bottom. 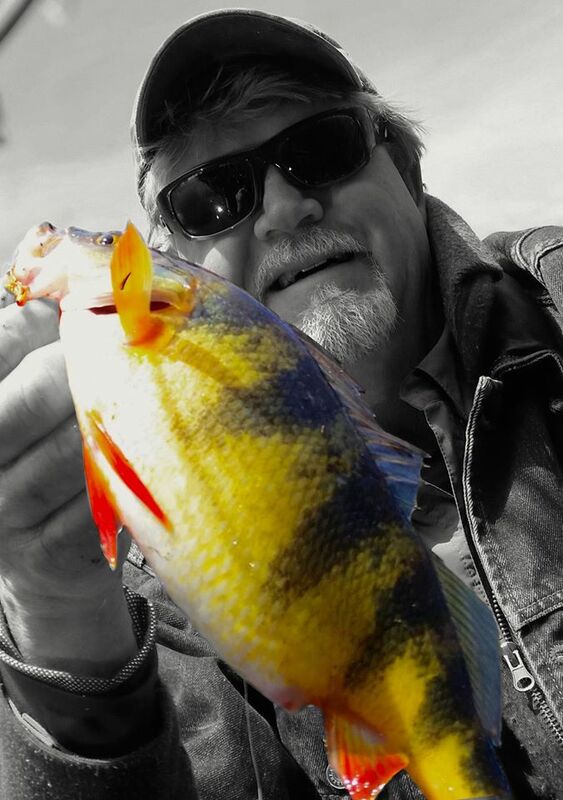 When the perch are feeding, it’s a sure-fire combination. Remember that perch usually move up the creeks and rivers in waves, and they’re very sensitive to changes in tides. If you aren’t catching for a while, it usually pays to stick around because the fishing will usually get better as conditions change and another wave moves through. 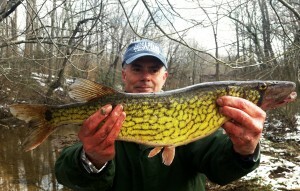 One of the perks to perch fishing in the tidal streams in the spring is that it isn’t unusual to catch chain pickerel. They’ll hit those same perch lures, or you might want to target them by switching over to a spinner or small jerk bait. As of this morning, I am getting reports of a few white perch starting to move up into the streams. 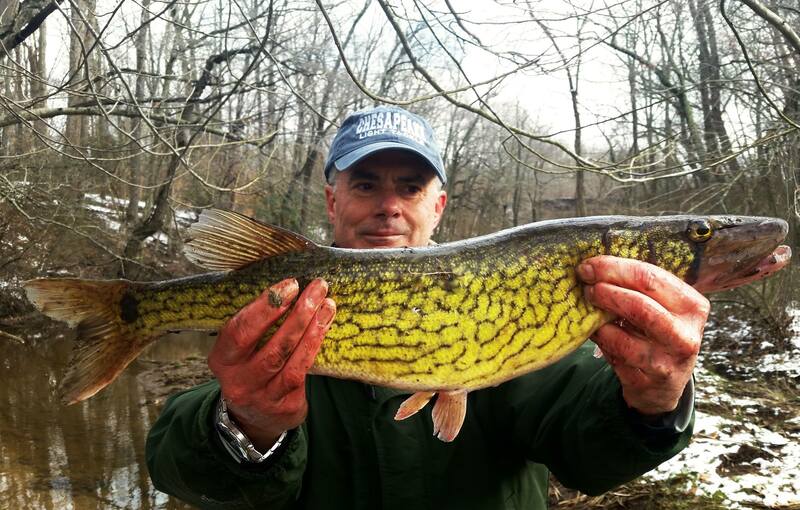 You can catch “black backs” all winter long in the main stem of the Bay, but in early March, they migrate into the streams and hang out in the deeper holes until conditions are right for them to spawn in the shallows. Many of the same locations where we are catching yellow perch right now will produce white perch. I fish for white perch exactly the same way as for yellow with the one exception being that I usually move the lure though the water a little quicker. I usually catch white perch with yellow perch mixed in up until Mid-April on the Eastern Shore. It also won’t be long until shad fishing starts. I typically fish the Potomac River above Fletcher’s Boat House for shad because I work in Washington DC, but the upper bay can also be good for shad fishing. There is also a nice shad run in some of the Eastern Shore rivers. Follow me here, on Instagram, Twitter, or on Facebook and I’ll keep you in the loop about when and where once the run gets started. My fishing partners and I are occasionally venturing out to the warm water discharges to striper fish. We’ve caught a few nice ones, but fishing is still slow overall. So, good luck fishing. When it comes to fish sandwiches, I can’t promise you won’t see me in the drive-thru line. Sometimes those two-for-five-dollar Old Bay fillets are too tempting to pass up, but I hope you aren’t missing out on some of the best pan-fishing we’ve seen in the past decade. Perch aren’t threatened and there are secure management practices in place to keep populations healthy. Don’t be greedy, but go ahead and keep a few. Fillets from cold-water perch that are breaded in corn meal and sprinkled with Old Bay might make the tastiest fish sandwich in the world. Along with that first osprey sighting, a March panfish meal is one of the Chesapeake regions most enjoyable rites of spring. Spring has sprung, so like the man said, Let’s party! Very nice report and story. I always enjoy your videos. Given that I also have a brand new puppy to take care of, the puppy has priority over my fishing. So, in an attempt to pacify my “fever,” I have been combing through webpages in hopes of finding some new fishing reports. Especially around Kent Islands and the piers.